Our ground floor fully equipped apartment with patio opens out onto the gardens set in five acres of tropical splendour, with its own fresh water swimming pool with children’s area and poolside Chinese restaurant and bar. Located within walking distance of the beautiful white sands and turquoise sea with an abundance of watersports, restaurants and Bajan culture. Close by, are the banks, a shopping mall, duty free and speciality shops, including a supermarket for all your needs. Positioned within easy access to discover and explore all aspects of the island. Frequent buses, taxis and car hire are minutes from the apartment. Apartment rep and services: We offer a complimentary meet and greet service to and from the airport for customers who stay 2 weeks or more. We also have a representative who will find you the day after your arrival at the complex and will give you information on all the events happening and any bookings you wish to make on the many excursions, shows or dining you may wish to choose. She can also arrange car hire at competitive prices if required. Places to visit: There are many gourmet restaurants in the area, if you wish to splash out. Also, many affordable restaurants such as 'Chefette', pizzas and many take-aways. The beach is a short stroll away from the complex. To the north and south of Golden view is Paynes and Mullins beach, known to be the best beaches in Barbados. Two of the most prestigious golf courses, The Royal Westmoreland and Sandy lane, are practically on the doorstep. One could bump into one of many famous faces!. Inland from Golden view you can visit the Harrison caves, which are unique, being discovered only recently. The beautiful botanical gardens and monkey park are also a must see. Further on to the rugged east coast, the terrain is such that one can only go, to appreciate the splendour. Travel Insurance: WE STRONGLY RECOMMEND YOU TAKE OUT TRAVEL INSURANCE AT THE TIME OF BOOKING. Bathroom has new vanity units, WC and tiled Power shower enclosure. On arrival, we were very impressed with the apartment - it seemed perfect for us, ground floor, lovely pool, everything we needed (and more!) provided in the accommodation, and the staff were very efficient. Sunset Crest is in a great location for the beach, local bars, restaurants and other amenities. HOWEVER, the first 2 weeks were spoiled by the extensive refurbishment program involving unbelievably noisy machinery. Our plan was to relax by the pool after my wife's multiple orthopaedic surgery, but we had to decamp almost every day to escape the noise. It was also disconcerting to see the receptionist wearing a dust mask! We feel we should have been notified of this. One of the residents informed us that the works had started in June. The works had decreased by week 3 and became tolerable. Notwithstanding this, we loved the island, the apartment itself and the Bajan people,and would love to return at a time when we could enjoy the facilities a bit more. Thank you for your review and we are glad that you enjoyed your stay at our apartment. Unfortunately due to Storm Kirk, Golden View had to carry out some emergency work which caused the disruption for you. We enjoyed our stay in Barbados. The property was clean and very adequate with all the necessities. One thing to note, the add says there is Wifi. Technically there is, if you want to sit in the Lobby to use it. The apartment had everything we needed for a relaxing stay and was a short walk to supermarket, beach and restaurants. Nice pool with more than enough sunbeds and lovely on site Chinese restaurant with good quality and quantity food. we stayed here for 2 weeks in March and had a great time . The apartment was well equipped , comfortable beds and we liked being on the ground floor as we had tables, chairs and sunbeds available to us. We like Golden view as it is in a great location - you can walk to the beach and many restaurants in Holetown- would recommend Tides ( fantastic service ,food and views) and Cafe Carizma in the Chattel houses for breakfast , lunches and the Tapas nights on Tuesday and Thursday ( you need to book in high season ) . 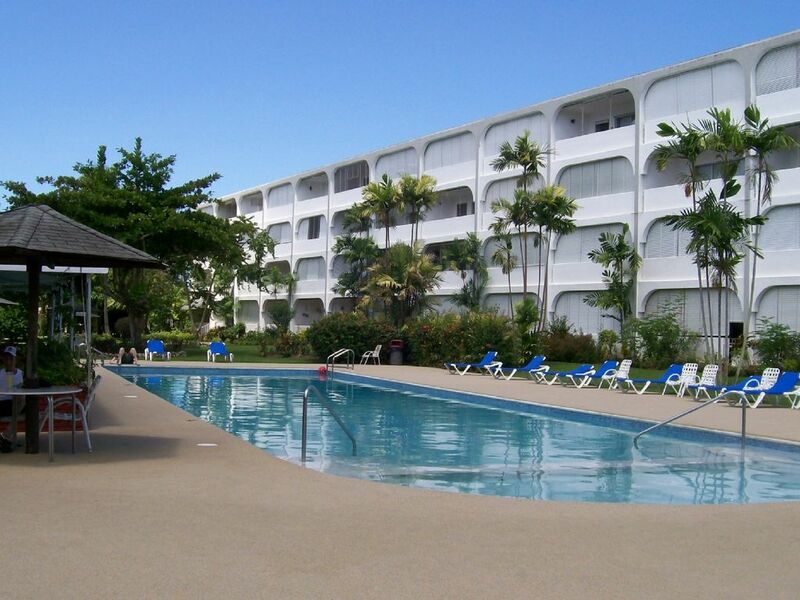 The complex is usually quiet and you can always get a bed around the pool - it's great for chilling out here . The Chinese restaurant does great food although the service is not great !! ( in fact it's probably as bad as it gets !). We really appreciated the free taxi to and from the airport and the apartment was well maintained with regular maid service - loads of towels and beach towels which was great. Will definitely be booking again . Fantastic, idyllic, relaxing, ideal location. A spacious well equipped condo with everything as described. All you need for a relaxing sunshine vacation. Beautiful tropical garden with Frangipani, borganvillia, and jacaranda trees. Bamboo shaded patio tables for a sundowner or luncheon. Plenty of shade, a large pool with an area for children. Security in reception and Wifi access. Car parking and within walking distance of shops, chattel houses, supermarket, medical centre and most important a clean white sand, Caribbean blue sea! Paradise! Golden view is a condominium in Sunset Crest next to Holetown, in the parish of St James. It is situated on the west of the island known as the platinum coast because of its white sandy beaches. The capital of Barbados Bridgetown, is south of the apartments. The airport is approx. 30 minutes drive.